This is a classic Lao food item called ເຂົ້າຕົ້ມ (kow dtom) . It has become a custom that whenever there is a big temple related celebration or function that the local women will make this food item to bring to the temple. It can be eaten as a snack or a dessert - and eaten warm or at room temperature. Nowadays you see it being served at Lao-Thai restaurants as a final dessert course. The ingredients are essentially sticky rice with coconut milk and sugar. Bananas, black beans or taro are often added to the center. Everything is brought together and wrapped in banana leaves. Each person makes it to their own liking and preferences, varying the portions of each of the ingredients. 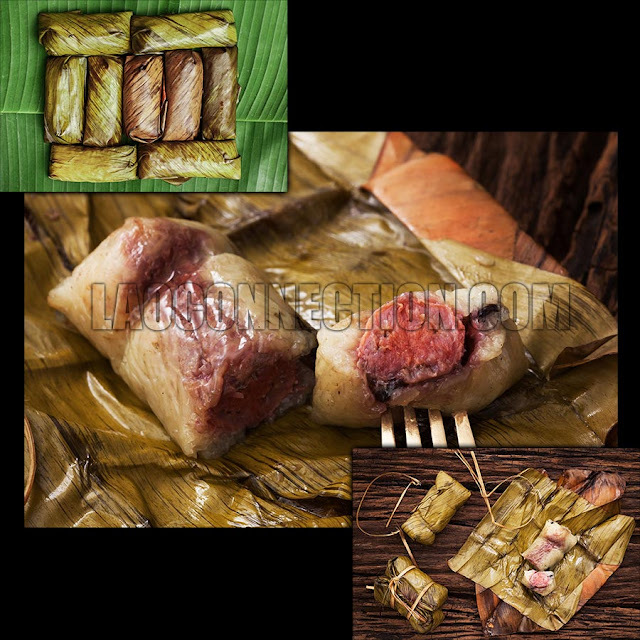 The classic recipe though involves putting all the ingredients together, wrapping it in banana leaves and steam cooking it in a boiling pot until the sticky rice is completely cooked. My personal preference are ones that have slightly sweeten sticky rice with lots of coconut milk along with a small piece of banana stuffed in the middle (as shown in the pictures here). The banana changes color after having been cooked. The final product is a semi-sweet dessert that brings a variety of textures - from the chewy yet creamy sticky rice to the soft center with the banana, and the aroma of coconut milk.